Mix the most disguisting things you can find in your kitchen. Eat them. 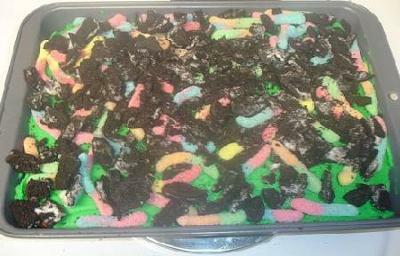 Those worm-mud cakes. Little kids love them. Make one. Eat one. Lick the floor. A lot of the floor. Keep a fluff-bunny on your mouth until the game's finished. Keep someone's finger in your mouth until the next four people finish their dares. Eat an earthworm. Or other bug/insect. Lick mustard off someone's feet. In a silent test at school(or just any test, somewhere) fart really loud. (*) Disclaimer: Don't do the lightbulb thing, this is very dangerous! Else, those dares look pretty disgusting to me, Flynn the Ninja! Everyone, what do you think: Do you know even more disgusting dares? Share them in the comments! Get a piece of food and chew it. Then take it out of your mouth and make a player eat it and make sure they SWALLOW!! Take a shot of lemon juice. Once I was having a sleepover and we were playing truth or Dare and I always chose dare and I never turned a down so my friend dared me to do literally averring a dog did dor 1 week so I did. I went for walks did tricks. I was given a shock collar so whenever I did something wrong they would shock me I ate dog food and dog treats. I also had to be naked all the time and whenever I have to go to the restroom I had to go outside it was so embarrassing. Join the community and write your own page! Simply click here and contribute to Truth or Dare Questions and List of Dares. Once I we dared each other to eat nasty stuff. One of my friends made me eat a half eaten sandwich which has been in the garbage already! Lick ketchup out of someones belly button. Would you make out with Ashton Coucher (or use someone's name)? OK I seriously don't know who that is, someone please hit me with a stick! Would You Rather questions are always a good idea if you run out of creative "Truth" questions. Do this dare to someone who is extremely ticklish on his/her stomach and have a blast watching! Experiment with all other sort of food stuff. Feeding people stuff is great, I think ketchup is still kind of mild (compared with a serious spanking!). A mouthful of mayonaise - Bonus points if they gargle it for half a minute! A spoonful of cinnamon (that is the so-called Cinnamon Challenge and it's harder than it sounds! Get wild and creative and - please, everyone: don't throw up!